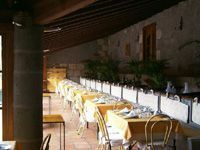 Hacienda Del Buen Suceso Arucas, Hotel Spain. Limited Time Offer! More of aRead more Family establishment, this four star hotel is located in Arucas. Several amenities, notably n.a. are available at the hotel.The hotel is located in the west section of Arucas, at Crta Arucas A BaÂ²aderos, Km 1, only 10 minutes walking from the city center.For those going to the airport, Gran Canaria is 15 miles from the hotel which is about 50 minutes by car.